Rick’s Diagnostic and Repair Service! 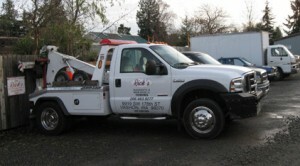 We currently tow vehicles in Tacoma to Rick’s, another repair shop or to your home. Rick’s owns a Ford F-450 light-duty wrecker and a Ford F700 Medium Duty wrecker and is certified as a trained wrecker through Towing and Recovery Association of Washington (TRAW). Including Lockout Service, Flat Tire Change, Gas Delivery and Jump Start.